Make Space Your Space My Space by Beth O'Brien and Kendra McCarthy attempts to address the lengths we as a public go to, in order to maintain some form of anonymity and ownership over our own physiological and physical space. Functioning through a faux campaign, the project aims to temporarily challenge the transient nature of the train station forecourt by inviting the public via a campaign to participate with the newly created "public space". MSYSMS acts as a site in which to bring online communities into a physical reality, blurring the boundaries of what constitutes personal space. Combined with the earlier installation on the same site, We Are Moving Forward Positively created by Gemma Tweedie and Matt Gillies, the culminating archive of documentation and images of the projects facilitate an interactive platform at which reflections of site and site specificity, and the relationship between 'urban condition' and its transient community, can be thoroughly discussed and experienced. 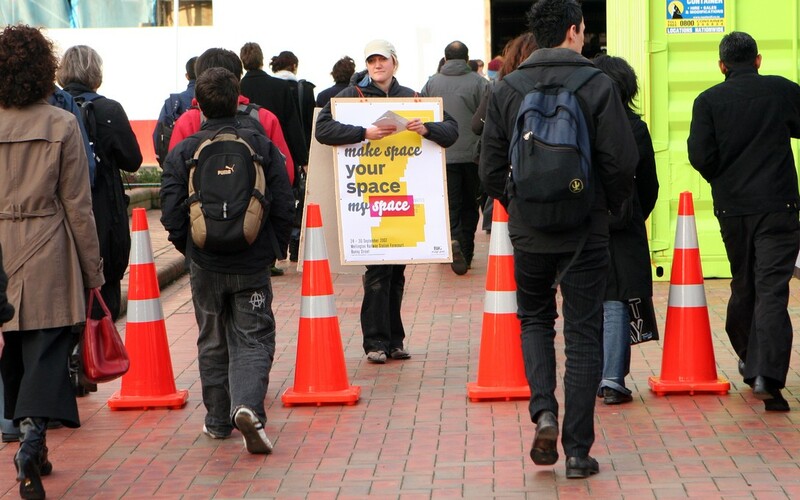 As part of the citywide project INSite 2007, a Wellington City Council Urban Design Initiative.